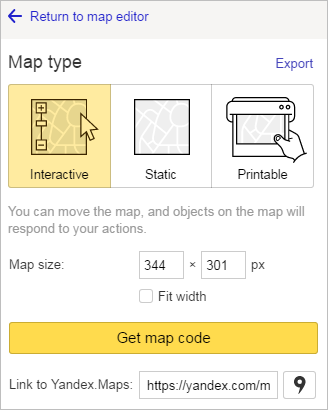 After you've created your map, you can get a code to insert it on a site, blog, or mobile app, as well as a link to see your map on the internet. You can also export your map to a file. See the Exporting map items section. Keep the technical limitations in mind when creating your map. Interactive map. This type of map is movable and users can interact with the items on it. See Interactive map for more information. Static map. This map is in PNG format. Static maps have limitations on the number of items they can include. See Static map for more information. Printable map. This is a high-resolution map image that can be printed. For more information about this map type and current restrictions, see the Printable map section. Map size. Map sizes can be set either by changing the numbers in the “Map size” fields (size is denoted in pixels (px)) or by changing the size of the highlighted area on the map (for more information, see the Map Constructor API). Go to the Map type toolbar and click Get map code. 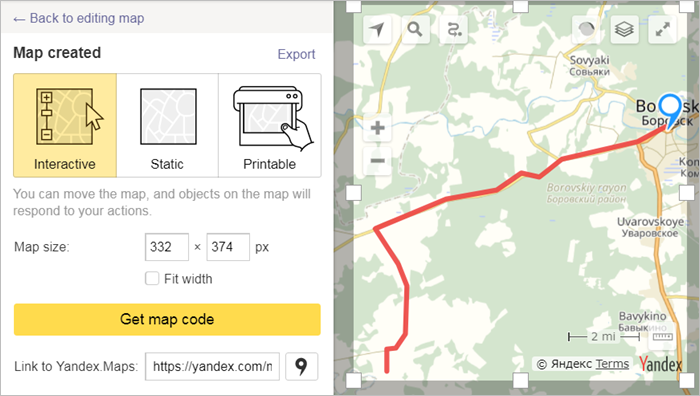 Copy the contents of the Link to Yandex.Maps field from the Map type toolbar. Go to the Map type toolbar and click Open in Yandex.Maps . Your map will open in Yandex.Maps along with the info panel (see above). Click on the Share button from this panel. In the form that opens, you can copy the link to your map (or the code that lets you display your map). To get a link, click next to the appropriate map in your list and choose Share from the menu that opens. Then copy the link to your map from the form. See Create a map for more information. Static maps have limitations on the number of items they can include. Set map size. Map sizes can be set either by changing the numbers in the “Map size” fields (size is denoted in pixels (px)) or by changing the size of the highlighted area on the map (for more information, see the Map Constructor API). You can copy the code that lets you display your map from the form that opens. See the Map Constructor API section for more information. Map size. Map size can be set either by changing the numbers in the “Map size” fields or by changing the size of the highlighted area on the map (for more information, see the Map Constructor API). For printable maps, you can select your unit of measurement: pixels (px), inches (in) or centimeters (cm). File format. Select the format (PNG or JPG) of your map file. Quality. Choose your map's bitmap resolution: 96 DPI (for viewing in WEB) or 300 DPI for printing the map. They are set to the "map" layer type; it's not possible to create a printable satellite or hybrid map. They are large-scale maps; it's not possible to create printable maps of a zoomed-out area. You are using the latest version of one of these desktop browsers: Firefox, Chrome, Yandex.Browser, Edge, Safari or Opera. If you're not concerned with your map's resolution, click Use standard print and print the map without these restrictions. 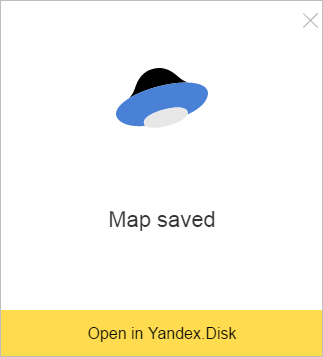 Your file will be saved under the name you gave your map in the Yandex.Maps Constructor folder, which is created automatically on your Yandex.Disk.